My first book was published less than four years ago. But in those four years, the shape of online book publicity has really changed, which has forced me to learn some new tricks before Julia's Child comes out next year. One of the biggest changes I can think of is the emergence and power of book bloggers as advocates for new titles. But it’s one thing to appreciate book bloggers and quite another to actually harness this new force in the universe. Book bloggers are a diverse bunch. It’s intimidating. So I asked book blogger Jen Karsbaek to weigh in on working with them. Here’s what she had to say. Working with Book Bloggers and the Worst. Pitch. Ever. Over the past few years - as publicity budgets are slashed, bricks and mortars bookstores close (RIP, Borders), and as more and more people have turn to The Great and Powerful Google for every question they have about any product they might possibly want to buy - book bloggers have become increasingly important in the publishing world. It would be easy to sit here and tell you why you should care about book blogs and the (mostly) wonderful people who run them, but author and publicists have already written boatloads of those sorts of posts. For example, Amanda Hocking (yes, that Amanda Hocking), wrote a post in which she more or less credits book bloggers with quadrupling her sales of My Blood Approves in a month. Please allow me to introduce myself. I’m a self published science fiction author from [redacted] looking for exposure. The problem is, I can’t afford a publicist, so I have to self promote. My dream is to become a well known science fiction author. Unfortunately, my books are not widely distributed, and are only available online. However, I’ve attached copies of my books for you to read. Yes, this is an ACTUAL pitch I received at my blog, identifying information changed to protect the clueless. It is also perhaps the textbook example of how to not pitch a book to a blogger. Can anyone spot the most ridiculous error of all? Yes, that’s right, while telling me his entire life story, this guy FORGOT TO MENTION THE TITLE OF HIS BOOK. Yes, in this case there were files attached, but you’re never going to get anyone to read your book if you can’t build a little interest for it, and that is fairly difficult to do without a title. His other major mistake? Not that he told me far more than I wanted to know about his money troubles (although that made me cringe with every sentence), but that he didn’t do his homework. You see, I, like most book bloggers, include on my blog a review policy. Mine includes my stats, what an author or publisher can expect when pitching me a book, what formats I read, and, perhaps most importantly, which genres I do and do not accept. Most review policies contain similar information, but almost every single one of them will include those genre preferences. 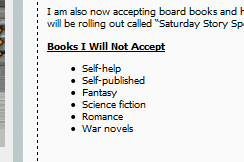 This is important, because right there, under my review policy, it clearly states that I do not accept science fiction. Or self-published books, for that matter. These are my personal preferences, and, really, it behooves authors to respect them. Do you really want someone who isn’t into science fiction reviewing your space opera? Or someone who doesn’t like romance reviewing your bodice-ripper? Sure, your book might be the breakthrough which makes them realize they love the genre, but even if that happens, it is not terribly likely that their audience is there looking for that genre. They have built up a trust with the blogger around certain types of books, and chance are good that they either are just not interested in the genre, or that they have someone else from whom they take recommendations in that genre. Plus, I see no reason for authors to foot the bill for book blogger experiments in genre-busting, but that is probably less important than finding a blogger with an audience who can appreciate your book. You know, I get why authors just email the first book blogger they come across, I really do. The book blogosphere is big, and can be confusing. You aren’t doing yourself any favors by just contacting any old blogger, though. Just as you wouldn’t (or shouldn’t) blindly email every print reviewer you can think of, you mustn’t do so to bloggers, either. There is a book blogger out there who is exactly right to review your book, but it will take some research, either on your part or on the part of a publicist. When it doubt, find someone who knows the blogosphere well, and let them work for you. Sarah: Many authors will already be nodding along with you here, because the good advice to “do your homework” will sound familiar—it’s the same lesson that many of us were required to learn in order to find an agent. Do you have any tips about how to do it? What advice do you have for our search? Start reading blogs before you are ready to ask bloggers to review your work, that way you can find blogs that review books similar to your own and get a feel for who might be interested in (and will hopefully love) your book. Twitter is a good way to 'meet' interesting bloggers, and a way to begin to build some relationship with them, so that jump at the chance to read your book when the time comes. If you have no idea where to start, try searching the Book Blogger Search Engine for some titles comparable to your own and see who has reviewed and enjoyed them. Look at those blogs, and the blogs of people who have commented on those reviews and continue to expand your book blogger search from there. Once you've found your favorites, get to know their voice and blogging style and, above all, before you pitch, check the review policy! Jen Karsbaek been blogging about books since February of 2008 at Devourer of Books (www.devourerofbooks.com). She is also the cohost of the regular book-related podcast "What's Old is New." (whatsoldisnew.tumblr.com) and the founder of Booklicity (www.booklicity.com), which is devoted to targeted online publicity for books and authors. You can follow her on Twitter at @devourerofbooks. Thanks for the great tips. I think it's also valuable for authors to pay careful attention to reviewers' personal likes and dislikes, and tailor pitches accordingly, much as we do with literary agents. 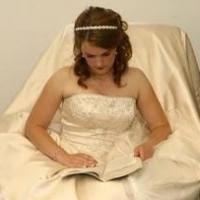 Book Blogger Search Engine --- brilliant! Who knew? Now I do. Exactly--who knew? Thank you, Jen. I knew I wanted to meet book bloggers but wasn't sure how to find them. A very helpful post. Great post. Sarah, I've given you an award at http://laurabwriter.blogspot.com/2011/07/blog-awards.html Thanks for your blog! I'm a book blogger and I've definitely seen how different book pitches can be. The good ones have all of the important information right up front: title, author, and a brief summary of the book right in the email. It makes it easy to know whether or not the book is going to be a good fit for my blog. I've also seen some pretty bad pitches. I got one this morning where the author emailed me about something like 4 books (not sure of the actual number because the email was so disjointed) she wanted to know whether or not I would be interested in reviewing. It was a huge email and definitely could have used some editing. Also, I'm not sure she really looked at my blog to see the sorts of books that I typically read. Book bloggers can definitely be a great asset for authors/publishers/etc. but it pays to do a bit of ground work and research before reaching out to us bloggers. It helps us help you!